Peanut butter is one food many of us love to snack on. But if you’re about to start a Mediterranean diet, should you ditch it altogether? After all, how can peanut butter fit with a traditional Mediterranean diet? This article will go through some of the key points to remember so you can make an informed choice. Peanut butter is fairly rich in nutrients and a decent plant-based protein source. It’s also loaded with fiber, vitamins and minerals. Many studies have found peanuts can help lower LDL (the ‘bad’) cholesterol, heart disease and cardiovascular disease risks (1, 2, 3, 4). One study found women who ate peanut butter 5x per week or more were at a 21% reduced risk of type 2 diabetes (5). Peanut Butter Contains Saturated Fats — Is That Healthy? The Mediterranean diet generally recommends lowering your saturated fat intake. A typical 2 tbsp serving of peanut butter has 3.3g of saturated fat. In the UK, the NHS recommends 30g of saturated fat a day for men and 20g for women at most. The American Heart Association recommends 5-6% of calories coming from saturated fats. For a 2,000 calorie diet, that equals 11g-13g of saturated fat. Simply eliminating all foods containing saturated fats might not be the best idea though. This is because the foods tend to get replaced with refined carbohydrates and sugar. This may worsen the risk of cardiovascular disease (6). Instead replacing saturated fats with unsaturated fats helps reduce heart disease (7). Even healthy foods such as olive oil which are regularly consumed in the Mediterranean diet contain some saturated fats. Even though it has saturated fats, it is also full of healthy unsaturated fats too. About 80% of the fat found in peanuts is unsaturated. These are found in similar ratios even when compared to olive oil. In moderation, some saturated fat is fine. Eating a lot of it though can clog up your arteries and underlies most cardiovascular disease. 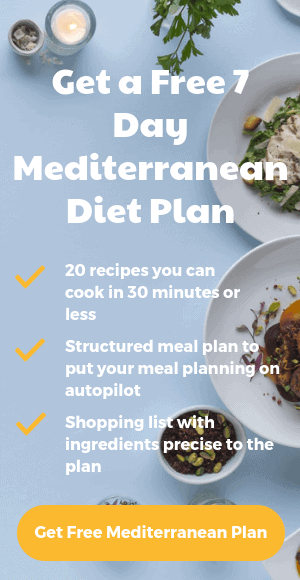 Can I Lose Weight on the Mediterranean Diet Whilst Eating Peanut Butter? Because nuts are high in calories and fat, many people avoid eating them out of fear they are fattening. However, those fears are misguided. Studies regularly find eating peanuts doesn’t result in weight gain and may even prevent it (8, 9, 10, 11, 12). It found that those who ate two or more portions of nuts a week had a 31% lower risk of weight gain, compared to those who never or rarely ate them (13). Nuts have a high satiety value. This means they help you feel fuller for longer and this helps reduce overall calorie intake (14, 15). Some studies suggest we may not absorb 5% to over 20% of the fat in nuts, which is excreted instead (16, 17, 18, 19). What Type of Peanut Butter Should I Buy? You should try and buy peanut butters that are as close to 100% peanuts as possible, with some salt at most. Check the ingredients on the label before you buy. Many brands add extra ingredients such as oil and sugar to enhance the flavour. The problem is this can also reduce their nutritional value. Liquid unsaturated oil is turned into a solid fat by artificially adding hydrogen. This process is called hydrogenation. During this processing, trans fat is made. Trans fat can increase the risk of many health problems including heart disease and inflammation. These do add some extra saturated fats to the peanut butter already. However, are additional environmental concerns with the plantations needed to grow palm oil. This is mainly because oil palms need to grow near the equator or high-productivity areas that have high biodiversity. Plantations can often destroy biodiverse habitats like rainforests. Often the palm oil is certified as sustainable, but it seems unlikely that any plantations can be truly sustainable. If you’re following a Mediterranean diet and want to eat locally sourced food, then be aware. Stabiliser E471 is a mono- and di-glycerides of fatty acids. It is used as an artificial stabilizer, often used instead of palm oil. The stabiliser helps oil and water to blend. This prevents the oil in peanut butter from separating. Currently, food producers mostly use monoglycerides and diglycerides in small amounts. This makes it is difficult to say how eating large amounts of these types of fat will impact human health. It’s a versatile cooking ingredient and perfect for vegetarians, dairy-free and gluten-free diets. Try some of these recipes below. Creamy, delicious, and filling, this African peanut soup is brimming with rich full-bodied flavour and each serving contains a significant source of Vitamins A and C to boot. Chicken isn’t the first thing that comes to mind when you think of peanut butter, but this protein-packed dish is perfect for hungry families! Peanut butter isn’t found in traditional Mediterranean diets. That doesn’t mean you need to can’t eat it though. If you buy 100% peanut butter, the health effects of regular peanuts should be almost identical to those of peanut butter. It’s essentially just ground peanuts. As with all types of nuts, they contain high amounts of plant protein, fibre, vitamins and minerals. Although they are calorie dense, most studies suggest they can help you lose weight. Simply eat in moderation, don’t gorge and you’re all set.